We are a parish of the Orthodox Church in America (OCA), serving Christ in the Cohoes and Greater Albany Capital Region. 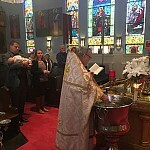 Our liturgical services are primarily in English with small sections in Church Slavonic, Romanian, Greek or Arabic depending on the needs of the congregation at that time. We are a community of people from various ethnic and social backgrounds sharing a common commitment to the Lord, each other, and the Apostolic Faith. We warmly welcome all families, couples, and individuals who are looking for a deeper experience of the salvation offered in Jesus Christ. Welcome to St Nicholas Orthodox Church! We hope you will enjoy your visit. We are a parish of the Orthodox Church in America (OCA), serving Christ in the Cohoes and Greater Albany Capital Region. Our liturgical services are primarily in English with small sections in Church Slavonic, Romanian, Greek or Arabic depending on the needs of the congregation at that time. Even though our name implies we are Russian, we are truly an international community. Our parish consists of 60 parishioners in "good-standing" with an outreach of approximately 130 who come to our church at some point in the church year. Our church is mainly composed of second and third generation people with origins from Lemkovyna (a region now part of Ukraine, Poland and Slovakia). Recently, our church has become the spiritual home of a smattering of immigrants from Romania, Macedonia, Georgia, Moldova, Belarus, Russia and our own community here in America. Our mission is to expand our Christian family by embracing all people who want to share a life in Christ and to be the home for people of all backgrounds. For information regarding church matters only please call Fr. Terenti at 518-369-2430. DO NOT CALL THIS NUMBER FOR FLEA MARKET QUESTIONS. For flea market inquiries please call 518-867-4102 or email us at: saintnicholasfleamarket@gmail.com. The slideshow is from the Hierarchical Divine Liturgy on Sunday of our 100th anniversary weekend. Principal celebrant was His Grace Michael Dahulich, our diocesan bishop. The monthly bulletin is available by clicking "Monthly Bulletin" on the top menu and following the link. The monthly calendar which lists the services and meetings for the month is available by going to the "Schedule" link on the top. The virtual images on this site are the exclusive property of St. Nicholas Orthodox Church, Cohoes, NY. Educational use is permitted; however, the content may not be re-purposed, reproduced, quoted without proper citation, or offered for sale in any form without the express written permission from St. Nicholas Church Board and/or the owners of the original images, if applicable.